26 Jan 2016 --- 26 Jan 2016 –- Sensient Flavors’ APSS (All-Purpose Sweet Solutions) and DairyBoost portfolios help ice cream manufacturers differentiate themselves in the premium market. With demand for better-for-you options in the ice cream segment experiencing notable growth, Sensient’s solutions are designed to reduce fat and sugar significantly while compensating for any associated sensory shortcomings, particularly in terms of texture and mouthfeel. The flavorings are natural, Halal & Kosher certified and also available as organic versions. High quality botanical extracts derived using state-of-the-art technology to closely match the sensory characteristics of the raw materials are the fundamental building blocks of both ranges. In combination with Sensient’s comprehensive expertise in flavor technology and application know-how, authentic signature taste profiles come to life. APSS and DairyBoost can be used as single solutions to lower either sugar or fat, and in combination to reduce both. By lowering the sugar and fat content, Sensient’s innovative ingredients enable significant calorie reductions while maintaining the indulgent, rich flavor and creamy mouthfeel of traditional ice cream. Both systems can be tailored to meet customer-specific requirements. APSS flavorings evoke and enhance the sensation of sugar, and emulate the body and mouthfeel that are often lost when developing low calorie products. Bespoke variants are available and can be engineered to enhance specific taste profiles. Furthermore, APSS can be used to mask the unwanted aftertaste of sweeteners such as Stevia, which is being increasingly used as a zero calorie sweetener in the ice cream segment across Europe. Sensient’s DairyBoost range is designed to deliver the rich mouthfeel and authentic characteristics of full fat dairy products. Working parallel, the non-volatile components emulate the authentic dairy mouthfeel and the volatile components capture the true dairy flavour profile. 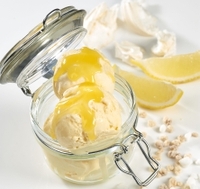 The result is a full fat organoleptic sensation for low fat ice creams or frozen yoghurts. Each DairyBoost variant has a rich, heat-stable dairy base with signature top notes, and can be used individually or in combination with each other. The range is available in different flavour profiles, including Cream, Coconut, Condensed Milk, Dulce de Leche, Fresh Milk and Yoghurt. “Better-for-you options are becoming more popular in the ice cream segment, but they are still niche products – and this is exactly what allows for interesting positioning possibilities. Our solutions enable manufacturers to set the highest benchmarks by developing low calorie ice creams with premium indulgence”, says Daw. Sensient Flavors brings life to products and creates sensory appeal for food and beverage customers across Europe, the Middle East and Africa. The company is part of Sensient Technologies Corporation, a leading global manufacturer and marketer of colors, flavours and fragrances. Its portfolio of Taste Modulation solutions, natural extract and flavour and color combinations offer the customer an unrivalled range of options for new product development. Sensient’s natural flavours are based on Sensient Natural Origins™, a range of authentic true to nature extracts derived from named source (FTNS) botanical and other organic-based ingredients, created using selective extraction techniques which capture the true flavour and aroma profile of the original source. Taste Modulation solutions offer a broad range of options to support the development of healthier food and beverages without impacting taste. The collection includes solutions suitable for alcoholic beverages that can rebalance the flavour profile of the product, mask burn or enhance taste perception. Close collaboration with Sensient Colors allows the development of customised colored flavoured solutions in food and drinks. Our knowledge in combining these ingredients in formulations can assist the development process, enabling customers to accelerate project completion and to deliver value-added end products. Thanks to its multidisciplinary capacities – comprising proprietary technologies and comprehensive expertise in flavour design, applications, regulatory issues, and market and sensory insights – Sensient Flavors is able to support food and beverage manufacturers throughout the whole supply chain. By exploring markets and closely monitoring consumer insights, we gather inspiration for innovative product concepts. Working with the customer, the company brings these concepts to life, ensuring that they meet the needs of the customer and the consumer. Sensient Flavors Europe focuses on the Beverage, Sweet and Savory sectors. The company’s customer base includes major international manufacturers representing the world’s best-known brands.